Last Saturday I posted about my new skirt, and said I would explain my companions’ outfits at a later date. Here goes. When London won the Olympics the team were unmistakable. In their matching Jeff Banks (who also dressed the Brownies, remember?) stone wool-linen blend tailor-made suits David and Sir Steve looked impressive. Their cornflower blue shirts were made from “the finest Italian two-fold cottons and tailored in Romania”. “As a special touch, each suit will have a subtle London 2012 logo embroidered on the inside serving as a good luck symbol to send the team on its way.” Tailored made? Perhaps Sir Bobby asked for extra long tailored pants, who knows? 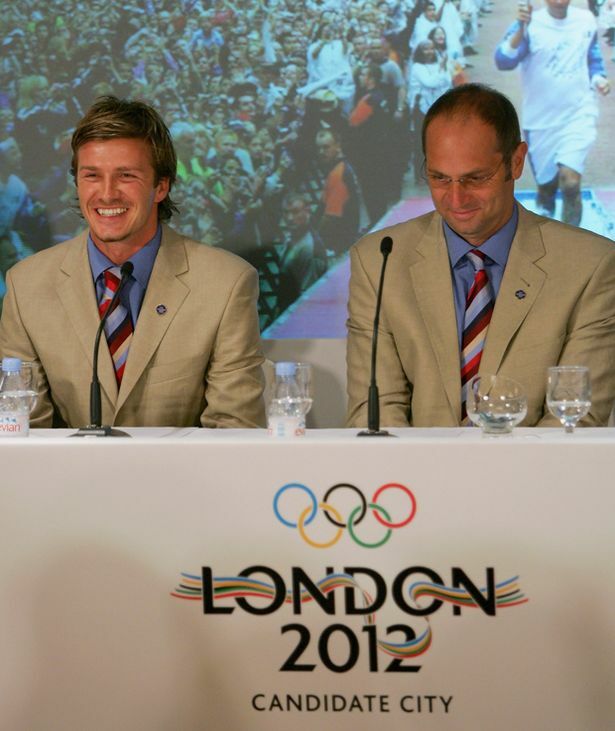 Based on the concept of being a winning team, the “Gateway Barnet” consortium decided to wear matching ties. I saw the memo. It explained that the men would be wearing navy suits, “crisp white shirts” and lime green ties (to match our logo), and would I like to wear a navy suit, white blouse and a lime green scarf? For me a navy suit/white blouse means Residential Care Home Manager. A colourful scarf in the same shade as the regulation tie I associated with a budget airline. And actually the lime green tie is a bit of a supermarket cliche, with both M&S and Waitrose getting their staff to wear them. Quite quickly the men on the team enthusiastically agreed that they would wear the ties. As the senior woman on the team this gave me a bit of a dilemma. lime green is not my colour. 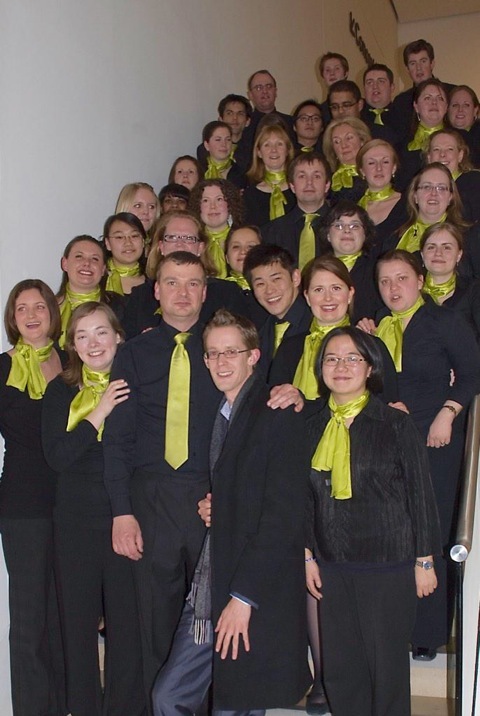 Here is a snapshot of the Deloitte’s choir, sent to me by my friend James Pargeter. I am not sure this outfit suits any of the choristers. if everyone is wearing a tie it may be a bit sexist to suggest a scarf “for the ladies” – the sartorial equivalent of a sweet sherry. I might have considered a jacket or blouse in the right colour (had it been something other than lime green), or I might have sewn the tie fabric into something personal like a silk handkerchief, brooch or beads, had it been supplied in time. I am different – why try to be the same? Clearly I wanted the team to perform well and win the business. In the end I decided that my fuchsia suit was complementary to the lime green and wore it with pride. I did add a green scarf, but a vintage silk one containing emerald, rather than lime, green. It took me some time to convince some of the youngsters that this was just a guideline intended to steer them towards smart clothes, not their usual jeans. In the end, I made myself a burgundy dress and cardigan jacket, patterned in triangles [maths degree, what can I say?] We [my little group of pals] all had brightly coloured corsages too, to ameliorate the overwhelming black of the gowns. Everyone who followed orders and wore black and white looked like a schoolkid, and the girls who went for a blouse option ended up looking complete scruffs as the weight of the hood [looped to a front button] immediately untucked the front of the blousesand hoiked them up…not a stylish look! My rebels and I, in our coloured dresses and corsages looked very snazzy! You were brave to wear something different but I admire that; you (as a team) would have all looked too matchy-matchy which, especially in lime green, would have looked sickly! Instead you stand our as a manager should. You delightful rebel, Kate…I would have just done what I was told not wanting to stand out and just blend in. Normally I save bright and wacky clothes for my own business where I feel freer to express my personality but three cheers for your fuchsia outfit! You look great and confident! I love a rebel! Good for you for standing up as an individual. I Would say you pushed the idea and came up with a sophisticated solution. I work for a company that has a very large fall national sales meeting that thousands attend and are expected to wear certain colors and garments. I always try and find a way to make it unique on me, and blame creativity for the results. Yes, you would have looked like a flight attendant – side note: I used to be a flight attendant for United, and for a short, glorious, moment we actually had fabulous “op art” patterned (though still in shades of blue) neck scarves. Loved mine, so chic. You look like a strong leader Kate, and most definitely stand out from the sea of green! When you know the shades that suit you, it’s so difficult to wear ones that you know do not. 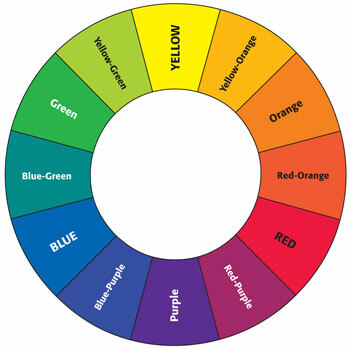 Especially in this case where the shade is at the other end of the undertone spectrum. You look vibrant and stylish and I’m glad that you opted for the suit. Hmm..conform is not something I do well. I love your suit and I agree – perfect complement!!! Why be a Pip when you can be Gladys Knight?